Michael Paterson is in line to make his first Saints appearance as Jim Mallinder’s men head to Wasps for a friendly on Sunday. Paterson, who moved to Northampton from Sale Sharks during the summer, did not play a part in the opening pre-season encounter at Saracens last weekend. But the 30-year-old lock has been named in a 29-man squad for the game at the Ricoh Arena (kick-off 3pm). Paterson’s fellow new boys Luke Eves, Pat Howard, Tom Kessell, Jamie Gibson and Paul Hill will also be involved. 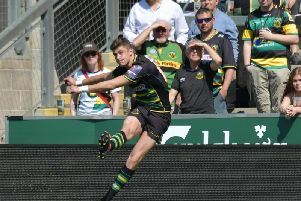 Saints secured a 36-17 victory at Saracens last Saturday thanks to two tries from Luther Burrell and further efforts from Tom Collins, Howard Packman and Gibson. They begin their Aviva Premiership campaign with a game at Worcester Warriors on Friday, October 16. Wasps also begin their league campaign on the same day, with a game against Harlequins beckoning. And they have opted to name a strong side to face Saints as preparations for the Premiership action continue. The likes of Christian Wade, Joe Simpson and Mutt Mullan, who will captain the team, will be in the starting 15. Wasps team: Miller; Wade, Daly, Macken, Tagicakibau; Gopperth, Simpson; Mullan (c), Johnson, Cooper-Woolley; Gaskell, Myall; Jones, Smith, Thompson. Replacements: Ed Shervington, McIntyre, Swainston, Cannon, Rowlands, Young, Rieder, Stevenson, Jackson, Lozowski, Jacobs, Bassett. Saints squad: Backs: Burrell, Collins, Dickson, Elliott, Eves, Foden, Hanrahan, Howard, Kessell, Myler, Packman, Stephenson, Tuala. Forwards: Clark, Day, Denman, Dickinson, Fisher, Gibson, Harrison, Hartley, Haywood, Hill, Nutley, Pateson, A Waller, E Waller, Williams, Woolford.